Chris Reid, left, in action for Whitley Bay against West Allotment Celtic. Whitley Bay defender Chris Reid has left Hillheads and signed for Northern League leaders Morpeth Town. 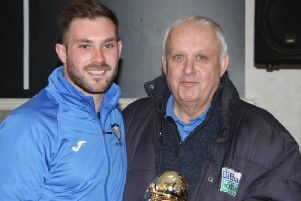 The 26-year-old, one of the club’s longest serving players, came through the Whitley Bay Academy to make his first team debut at the age of 19. He was a squad member of the powerful 2009-10 FA Vase winning side that defeated Wroxham 6-1 at Wembley. But after finding it difficult to gain a regular place in the side, he left to join West Allotment Celtic. He then spent a year in Australia playing for Brisbane Athletic before returning home to Hillheads in 2011. He quickly established himself as a first choice selection at the heart of the defence, but after winning numerous accolades in the 2013-14 season, including Player of the Year, he picked up a series of injuries which have limited his appearances over the last 18 months, and this season he has been in and out of the side with hamstring problems, starting only 12 of the club’s 27 games and playing the full 90 minutes on only eight occasions. He scored 23 goals in almost 200 appearances for Bay, one of his most memorable being the late equaliser in the FA Cup tie against Matlock earlier this season.